If there was a writer/artist duo in comics today that guaranteed my interest in a series it would be Brian Azzarello and Eduardo Risso. From Jonny Double to 100 Bullets and their work on Batman, the dynamic duo can draw me in to anything they collaborate on. 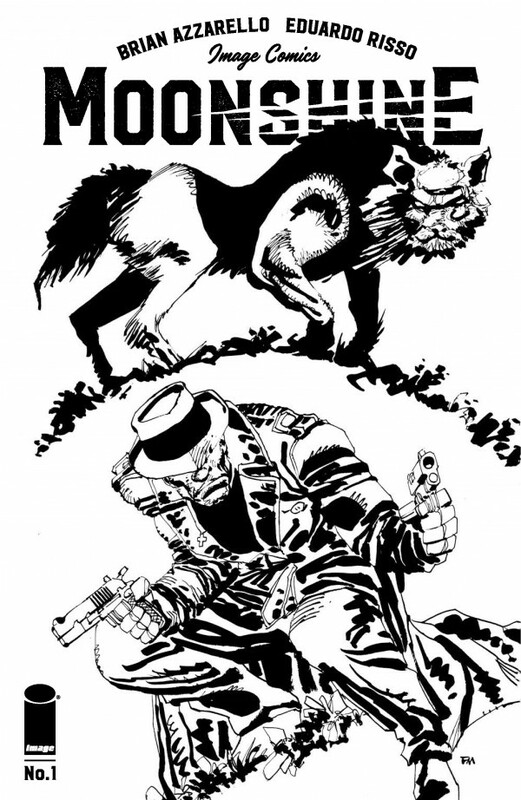 So when it was announced that they would be teaming up for a new series focusing on bootlegging with werewolves in 1929 they grabbed my attention. 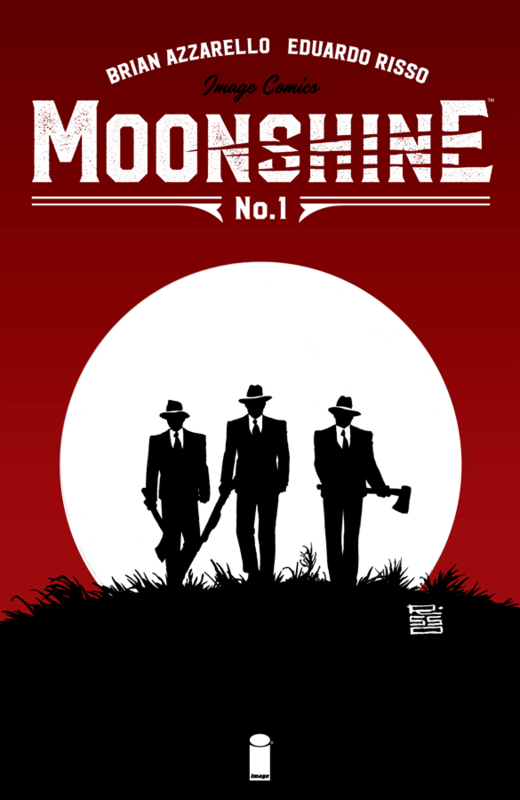 Moonshine has everything a supernatural period crime thriller needs. Compelling characters, excellent writing and art that perfectly matches the books tone. Writer Brian Azzarello has constructed a world that is incredibly rich and detailed, from the towers of New York City to the rural hills of Virginia. The series starts off with a bang, instantly drawing us in, and then it takes the foot off the pedal to weave in the main players. From New York mobster Lou Pirlo and his boss Joe Masseria, to the hill folk in Virginia crafting fine liquor. Every piece has its place on the board. Pirlo comes across as crass, rude, and self-absorbed, the exact kind of person that doesn’t fit in well with the simple people of rural Virgina. It places him in a bit of a rough spot when he has to find his way to Hiram Holt’s place and convince him to do business with Masseria and the Italian mob in the big city. Pirlo serves as both the protagonist and antagonist, with the story flowing through his action, and his thoughts. We see him scrambling to find a way to make the deal with Holt because he fears what would happen to him back in New York. Unfortunately Holt isn’t the country bumpkin Pirlo was expecting. He’s crafty with a side of cunning. He’s extremely protective of his moonshine and we see people find out the hard way as the issue opens. We get an idea of just how Holt manages to protect his operation, but by the end of the issue it’s safe to say that there’s more going on than what we’re privy to at the moment. Unfortunately we’re going to have to wait at least a month to see what happens next. The question is just what makes Moonshine so good? That’s easy, it’s the creative team. The book is classic Azzarello and Risso. Azzarello is a master of his craft, and it’s on full display here. He’s created characters that are multi-layered and complex. We get into the mind of Pirlo to see what makes him tick, but when it comes to Holt it’s his actions that speak for him. We’re shown the difference between the big city slicker and the simple country folk who don’t know any better. 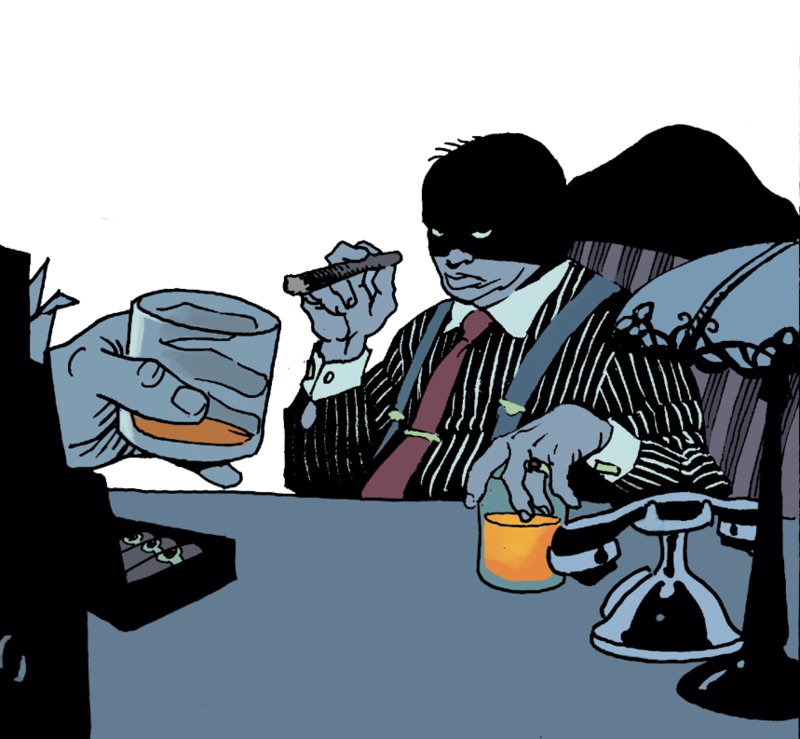 Azzarello introduces us to a world that is far more complex than just bootlegging. By the end of the issue we see a world of unknowns for many of the character, a whole new world with new possibilities. Unfortunately many of those possibilities seem deadly. Despite the excellent writing, the real shine belongs to Risso. Risso’s artwork is a perfect complement to the book’s writing style. The way he contrasts the environments of the brief city scenes with those set in the hill country is subtle and effective. The characters come to life, their facial expressions tell stories we have yet to hear. Sometimes all you need is a look or a smile to perfectly understand what a character is saying, and that can be found in so many of the characters here. Risso also handled the colors on the book, and his palette choices work flawlessly. 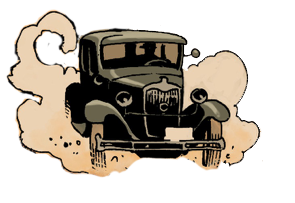 The weathered, near sepia-tone feeling gives the pages an aged sensibility. The contrasting colors between the city and rural Virginia act as a perfect delineation of where the story is at that point. For a first issue, Moonshine is a massive success. Azzarello offers unique and real characters and Risso’s artwork is the perfect companion. It leaves you wanting more, but it also leaves a feeling of satisfaction. Satisfaction in knowing that you just read an excellent book. Fans of Azzarello and Risso will not be disappointed. It’s great to see such a wildly popular creative team team-up for multiple books, let’s just hope that they can keep their win streak going.